Walk with us the great experience we have forged over the years, taking on new challenges, flying towards new horizons and always focused on giving the best service with the warmth of our large Latin American family that has always characterized us. 1919The national airline of Colombia was founded on December 5, 1919, under the corporate name, Sociedad Colombo Alemana de Transporte Aéreo, SCADTA. 1920The first Junkers airplanes arrived, and SCADTA subsequently was able to operate 25 type F-13 aircraft, a W33 Junker and a W34. 1920September: With Fritz Hammer as pilot, Wilhem Schnurrbush as CoPilot and Stuart Hosie as a passenger, SCADTA accomplished the first flight between Barranquilla and Puerto Berrío. 1921Routes between the cities of Barranquilla, Girardot and Neiva were established. 1929On 23 July, regular routes between Girardot and Bogotá were established. 1931The airline Transportes Aéreos Centroamericanos (TACA), was founded in Tegucigalpa, Honduras, in 1931. 1934TACA expanded into Central America, operating in El Salvador, Guatemala, Nicaragua, Costa Rica and Panama and flying a fleet of 14 aircraft, 10 pilots and 80 employees. 1939The airline began to position itself as a strong player in the Air Cargo Market transporting 10,000 tons of cargo and 200 tons of mail. 1940On June 14, 1940, Aerovías Nacionales de Colombia S.A. - Avianca, was constituted; the company resulted from the integration of SCADTA and Servicio Aéreo Colombiano – SACO. 1943 By this year, TACA already had presence in Colombia and Venezuela and was able to unite all of the Americas from the United States to Argentina. 1946Avianca expands it's flights to Quito, Lima, Panama, Miami, New York and Europe which were operated in DC4 and C54. 1946TACA centralized its operation in New Orleans. 1956Avianca flew the Colombian delegation that participated in the Olympic Games in Melbourne, Australia. A total of 61 hours of operation, stopping exclusively for refueling. 1960Avianca operates its first jet, the Boeing 707-120. In the following eight years the Boeing 720B, 727-100/200 and 737-100 were incorporated to the fleet. 1960The Salvadoran entrepreneur Ricardo Kriete gained control of the airline TACA. 1966TACA became part of the jet era, acquiring the BAC1-11 aircraft, originally from England. 1973Transportes Aéreos Mercantiles Panamericanos – Tampa Cargo S.A. is created and begins operations with flower exports to the United States. 1974First non-U.S. international flight in the route Mexico - Medellin. "Aeronáutica Civil” (Civil Aeronautics) authorizes Tampa the operation of the Medellín - Bogotá route. 1976Always at the forefront, Avianca became the first Latin American airline to operate the 747 jumbo jet (models - 100-200B), which until 1994 was part of its fleet. 1981The possibilities for ground service for passengers in Bogotá expanded thanks to the construction and commissioning of the modern Terminal Puente Aéreo of Avianca. Initially the routes to Miami, New York, Cali, Medellín, Pasto and Montería were served from this terminal. 1982TACA began operations to Houston and Los Angeles and resumed Honduras operation, specifically to Tegucigalpa. 1982Hub opening: Barranquilla and Cali. Two new aircraft B-707 became part of the Tampa Cargo fleet. 1983During a year of transitions, TACA created its maintenance station in San Salvador, ceased to operate in Guatemala and Costa Rica and began operations to San Francisco. 1988Tampa acquire his first Douglas DC8 aircraft. 1989Towards the end of the 80’s and during the early 90`s, TACA led the regional air industry consolidation, through the acquisition of operators such as Lacsa from Costa Rica, Aviateca from Guatemala, Nica from Nicaragua, Sansa from Honduras and five more regional airlines. 1990Avianca acquired two of the most modern airplanes in the world: Boeing 767-200 ER, which were baptized with the names of Cristóbal Colón and Américo Vespucio . 1990Tampa Cargo was decorated with the "Cruz al Mérito Aeronáutico", granted by the Colombian Government. 1991The first Douglas DC8-71 F for Tampa Cargo arrive. 1992The first McDonnell Douglas MD83 arrives. A year later, the Fokker 50 arrived for Avianca. 1994A strategic alliance was created, which linked the three most important companies in the aeronautical sector in Colombia: Avianca, SAM (Sociedad Aeronáutica de Medellín), and HELICOL (Helicópteros Nacionales de Colombia), which gave life to the Avianca system. 1996Tampa's agreement with Martinair, a Dutch airline part of the renown KLM group; was signed. 1997The Group of airlines was officially consolidated under the name Grupo TACA. 2000TACA expanded to South America with the TACA Peru brand, and starts operating the Lima hub. 2000Tampa cargo constructs a new hangar Rionegro Antioquia, becoming one of the most modern in Latin America . 2001As a result of the 2001 airline industry crisis, TACA began a transformation plan focused on the renewal of its fleet, implementing operational excellence and the optimization of the revenues and costs structure. 2002On May 20, Avianca and SAM along with Aces (Central airlines of Colombia) created the Alianza Summa. In November 2003 the shareholders decided to initiate the liquidation of the Summa Alliance society and gear their efforts towards consolidating the Avianca brand. 2003The conquest of new skies in America came with the introduction of flights to various destinations in United States. Two years later, TACA launched the first direct route between El Salvador and Perú. 2003Tampa Cargo celebrates 30 years transforming their corporate image and renewing its fleet of aircraft, receiving four Boeing 767-200 aircraft. 2005In line with its goal of achieving leadership in the region, the company changed its corporate name and registered as Aerovías del Continente Americano S.A.
2009Avianca returns to the stock market through an important advance bond issue in June. 2009Towards the end of 2009 TACA includes in its flight offer routes to and from main capitals secondary cities throughout South America. 2009In October, Aerovías del Continente Americano, Avianca; and the Central American TACA Airlines announce the signing of an agreement between shareholders which consequently begin their integration as AviancaTaca. 2009On October 7, they annonuce to the public the intention of uniting Avianca and TACA Airlines to strengthen its strategic position in the region and enhance their ability to grow in the industry. 2010In February investors formalized strategic union of their business. TACA International Airlines includes in the union it's participation in Lacsa, Taca Peru, Aviateca, Sansa, La Costeña, and Islena; from Avianca it includes, Avianca, Tampa Cargo and AeroGal. 2010After formalizing the integration of the airlines in the group, the companies began a rigorous process of administrative reorganization and integration of their route networks, unification processes and capture of synergies. 2011In March the unified frequent flyer program is launched, LifeMiles; to date it has more than 4 million members. 2011On March 28, AviancaTaca Holding S.A. issued shares with a value of 500,000 million Colombian pesos. The demand for shares, with preferential dividend and without the right to vote exceeded 2.8 billion pesos, equivalent to five times the base amount offered. 2011Throughout the year, 12 new routes were opened and 155 flight frequencies were increased, reaching more than 100 destinations in the Americas and Europe, through more than 4,000 flights per week. 2011The plan for strengthening the cargo business is launched, which includes the expansion of warehousing capacity in land and air. In this framework the purchase of four A330-200F freighter aircraft, with capacity of 70 tons is announced. The first delivery of this new aircraft will start on December 2012. 2011Tampa Cargo moves to the new warehouses at the International Cargo Terminal of El Dorado in Bogotá. 2012AviancaTaca and Airbus sign a purchase order for 51 aircraft A320 Neo. 2012On June 21, Avianca and TACA Airlines are officially admitted to Star Alliance, the largest and most important global network of airlines in the world in terms of daily flights, coverage and services, thus multiplying the options and advantages for its travelers. 2012The 10th of October Avianca is announced as the only commercial brand name for subsidiary airlines of AviancaTaca Holding S.A., Avianca, TACA, TACA International, TACA Regional, Tampa Cargo and AeroGal.The execution of the brand unification will take place in 2013. 2012Tampa Cargo receives its first A330-200F devoted exclusively to cargo. 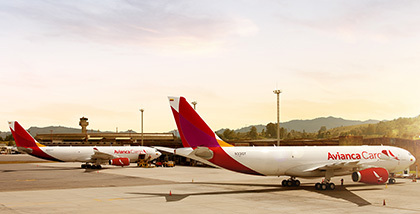 2013 The Cargo Vice Presidency adopts a single commercial trademark: Avianca Cargo and at the end of the year completed its fleet with its fourth A330-200F. 2014Avianca Cargo gets Certified as a Member of IPATA (International Pet and Animal Transportation Association). This is a non-profit organization that provides oversight to ensure that pet and animal transportation is carried out by professionals in a caring, humane, safe and healthy manner all over the world. 2014Avianca Cargo becomes accredited in operations by EQUIP (Enhanced Qualified User Program) at the MIA, MEX, SJU, SCL, BOG, SAL and LIM stations. This accreditation acknowledges the training necessary for the appropriate handling of CSafe containers for CoolCare shipments. 1946Avianca expands it's flights to Quito, Lima, Panama, Miami, New York and Europe which were operated in DC4 and C54. 1960Avianca operates its first jet, the Boeing 707-120. In the following eight years the Boeing 720B, 727-100/200 and 737-100 were incorporated to the fleet. 1990Avianca acquired two of the most modern airplanes in the world: Boeing 767-200 ER, which were baptized with the names of Cristóbal Colón and Américo Vespucio . 2009Avianca returns to the stock market through an important advance bond issue in June. 2009Towards the end of 2009 TACA includes in its flight offer routes to and from main capitals secondary cities throughout South America. 2009In October, Aerovías del Continente Americano, Avianca; and the Central American TACA Airlines announce the signing of an agreement between shareholders which consequently begin their integration as AviancaTaca. 1931The airline Transportes Aéreos Centroamericanos(TACA), was founded in Tegucigalpa, Honduras, in 1931. 1934TACA expanded into Central America, opening offices in in El Salvador, Guatemala, Nicaragua, Costa Rica and Panama and flying a fleet of 14 aircraft, 10 pilots and 80 employees. 1946TACA centralized its operation in New Orleans. 1960The Salvadoran entrepreneur Ricardo Kriete gained control of the airline TACA. 1982TACA began operations to Houston and Los Angeles and resumed Honduras operation, specifically to Tegucigalpa. 2000TACA expanded to South America with the TACA Peru brand, and starts operating the Lima hub. 2003The conquest of new skies in America came with the introduction of flights to various destinations in United States. Two years later, TACA launched the first direct route between El Salvador and Perú. 1974First non-U.S. international flight in the route Mexico - Medellin. &quot;Aeronáutica Civil” (Civil Aeronautics) authorizes Tampa the operation of the Medellín - Bogotá route. 1982Hub opening: Barranquilla and Cali. Two new aircraft B-707 became part of the Tampa Cargo fleet. 1990Tampa Cargo was decorated with the "Cruz al Mérito Aeronáutico", granted by the Colombian Government. 2000Tampa cargo constructs a new hangar Rionegro Antioquia, becoming one of the most modern in Latin America . 2003Tampa Cargo celebrates 30 years transforming their corporate image and renewing its fleet of aircraft, receiving four Boeing 767-200 aircraft. 2008On February 21, the first Airbus A320 arrived; to date Avianca operates 55 aircraft from this manufacturer. All pictures are the property of Avianca Cargo or used under express consent of Mauro Pérez and Bob Garrard, and may not be used without authorization of its legal owners.